We offer a variety of worship services and we are always pleased to welcome visitors and new-comers. To find out more about our historic church please follow this link or to this map to find us. Benefice Service in one of the five Parishes. About us: We are one of the smallest parishes with census population of 200, predominantly from professional and managerial backgrounds. The majority of householders are owner occupiers, the remainder in social and private rented housing. Most are incomers, do not have strong local ties, and are from a white European origin. We have neither pub nor shop but there is a very active village hall which, together with the parish church, form the village foci. Historically Sutton Waldron was an agricultural community but now few work on farms. There is little or no unemployment and work opportunities are mainly in the service sector. It is common to commute to work in towns within a 30 mile radius. Many residents are retired and are involved in a wide range of voluntary organisations and activities both inside and outside the village. There are many artists, musicians and craftsmen who add to a population of diverse talents. There is a friendly, cheerful and supportive community atmosphere here. and should not need major repairs or maintenance in the near future. The next quinquennial is due next year. The moveable pews and excellent acoustics make the building very suitable for many uses. We have one churchwarden and six members of the PCC. Some years ago they took the decision that there would always be a service in the church every Sunday, come what may. Some have been lay led and the quarterly, Let’s Celebrate gathering attracts many non-church goers and has been very successful. We are particularly anxious to encourage the younger members of the village and have taken a number of successful initiatives to make service formats more attractive to those new to the church, without alienating the more traditionally minded. There are 24 under 16s in the village of whom 17 attend church when asked to take part. We also have 8 regular young attendees from outside the village. We have 34 on the Church Electoral Roll and our average attendance for Share purposes is 22. Easter workshops on Good Friday are held with around 20 children making their Easter Gardens and Bonnets for display and judging at the well-attended Easter Service itself. LPA work includes visiting all and working with children. The annual Harvest Supper is very well attended by the whole village. Monies raised go to charity. Other functions arranged in company with Village Hall committee are held periodically. The new initiative within the Parish is the commencment of our 'Breakfast Church' this is held on the second Sunday of each month in the village hall and is open to everyone whether you come to church or not. A cooked breakfast is provided and in the second half of the event we offer a 'thought for the day' to inspire you and share something of the Christian Faith, this is n enviroment expecially conducive to those who would feel perhaps uncomfortable attending a 'Normal' service and for those with Families and young children. We have a charitable link with Southern Sudan in which we seek to fund and promote education within this very challenging environment and Bishop Francis the Bishop of the South Sudan has visited on a number of occasions. There is a vibrant society of Friends of St Bartholomew’s whose aim is to support the fabric of the church building. 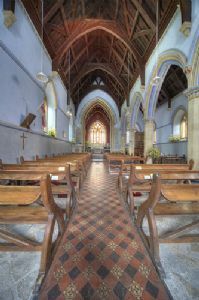 It involves nearly everybody in the village and it enables those members of the village who do not normally attend church services, but are interested in the wellbeing of the church building, to play their part. The considerable funds raised greatly reduce the financial burden of the church upkeep, much to the relief and gratitude of the PCC. The PCC is enthusiastically researching grants for improving and developing the church building. Projects in hand include: further improvements to church lighting, installation of a sound amplification system and repair of our historic church pews. Each year the DHCT 'Ride and Stride' event to help raise funds for the Trust is enthusiastically supported. There are a number of activities run in the village. These include monthly coffee mornings, a weekly art club, monthly WI meetings alternating with Iwerne Minster, a quarterly cinema club, monthly craft and design club for UnFinished Objects (UFO). These are well supported by church and non-church goers alike. Our renowned dance group, ‘Steps in Time’ introduces children to traditional Dorset dance. They perform at many local venues and international festivals Europe wide, meeting weekly to practice in the village hall. In summary: We are a caring and supportive community which is eager to embrace the faith and guidance of our new vicar.